1 block North of Roosevelt Ave; Near 7 Train 61st St Sta, LIRR Woodside Sta & Q32 64th St bus stop. Member of the Queens County Chamber of Commerce. Member of the Hispanic Chamber of Commerce of Queens. 20 Years Experience in the Insurance Industry. Born & raised in Queens, New York. St. John's University, B.A. Psychology. 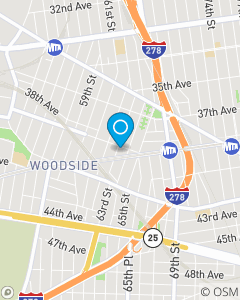 The Cynthia Koutsoliontos State Farm Office proudly serves the communities of Woodside, Sunnyside, Jackson Heights, Elmhurst, East Elmhurst and all of the boroughs of NYC. Our team of professionals provide remarkable customer service, free rate quotes and offer one of a kind industry knowledge. Call our office today. Hablamos Espanol.